Thank you for considering us for a Bengal kitten from eastern North Carolina. Wayne and I entered our 1st beautiful marbled Bengal in T.I.C.A shows nine years ago, still attend when we can, and occasionally breed exceptional pets. We have been members of The International Cat Association for 9 years, and just this year with heavy campaigning from dedicated Bengal breeders, The Cat Fanciers Association has welcomed Bengals to champion status, and we are new members of CFA! We have a small home on the crystal coast of N.C., and just a couple of litters yearly. We are not a big operation. We have been fortunate to have had 5 championed cats in the past , and are hopeful there will be more in our future. It is neither simple or easy to produce healthy, quality Bengals, and there are many costs, emotionally, physically, and monetarily. 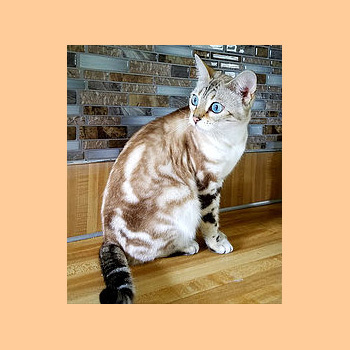 Careful thought and planning, years in the making, produce outstanding and cat club standard Bengals; cats that look and act like the Bengal you expect to receive when you envision a great Bengal. Our kittens are not just kittens from the neighborhood stray, so, please, do not be offended by price, a contract, or the fact that we want keep in touch with you throughout the good and bad of your new family member.